Friday’s visit to Early Mountain was one of the highlights of this trip. 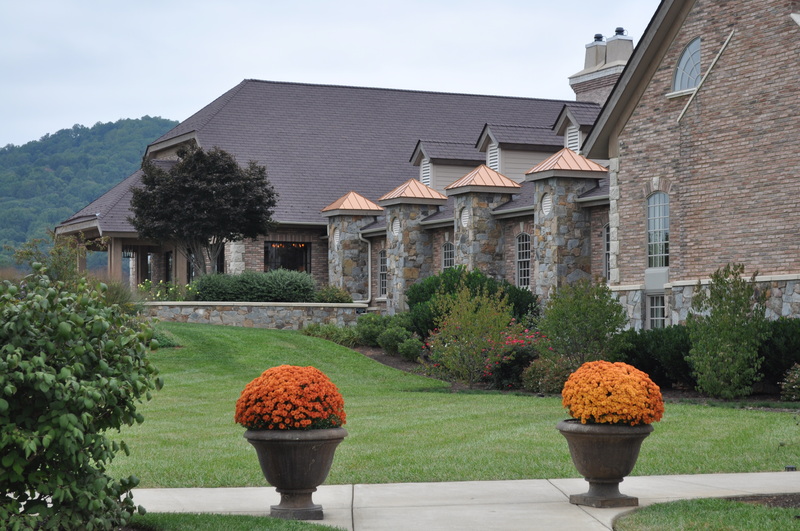 We had never driven the three hours down to the winery, which reopened in 2012 after extensive remodeling and the change of ownership. 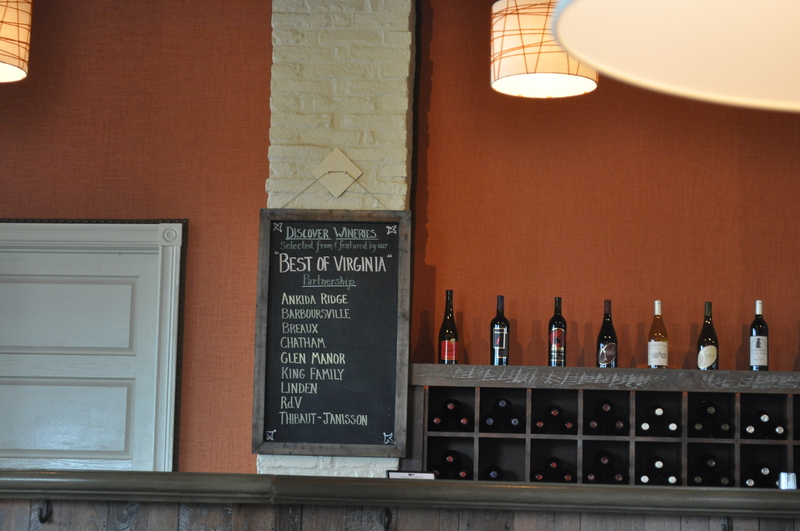 I kept seeing references to the winery, because of its unique “Best of Virginia” partnership program. 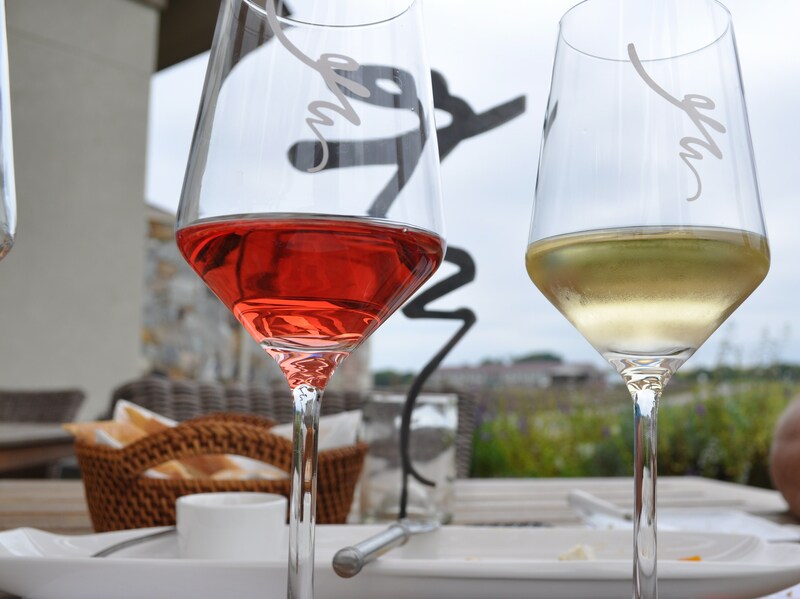 The chance to sample their wines, alongside wines from other prominent (and some not so prominent, but promising) vineyards, paired with excellent food, is what intrigued us. Madison VA is not far above Charlottesville. Easy to access. 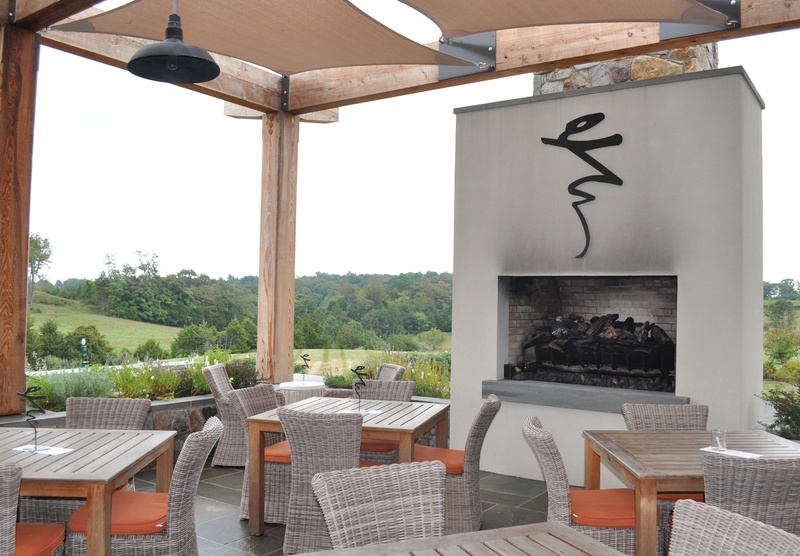 The welcoming entrance sets the stage that this is someplace special, where you can relax, enjoy, linger and not feel as if you are drowning in hordes of people winery hopping (something that makes many wineries in Northern VA unpopular with us). 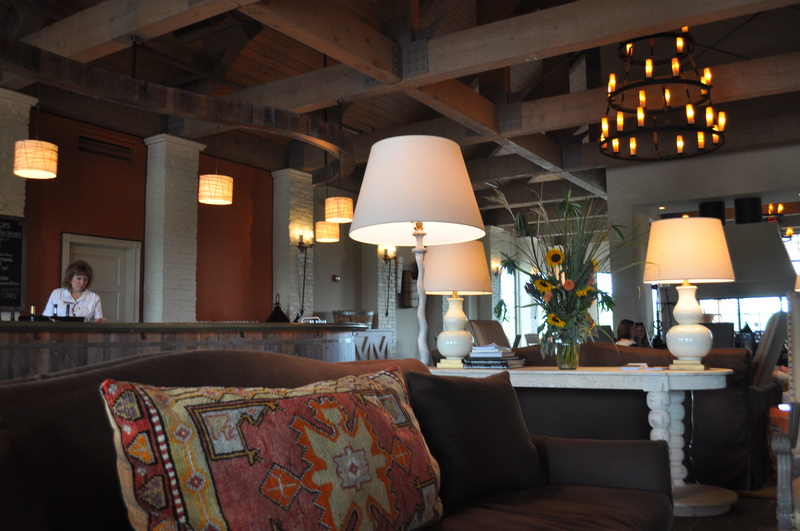 The inviting entrance area, full of sofas, a few tables, and lots of places to unwind, is what sets this winery apart. Add to that, the back terrace, with its huge fireplace. Makes al fresco dining a joy. I could have lunch here almost every week of the year and be happy. I like the changing menu and the changing wine pairings. We started with a mixed sampler. Two cheeses and two meats. We each picked a different four wine sample. 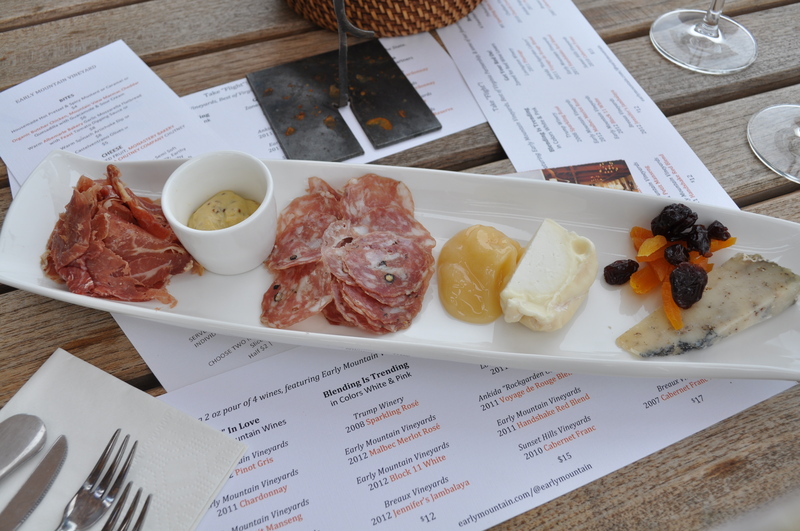 Love how you can mix, and match, the wines with food. But, if truth be told, we went there specifically to try and buy Ankida Ridge Pinot Noir. Yep, Pinot Noir from Virginia. Ankida Ridge is really small. Their wines, though, are absolutely luscious. We did buy some Early Mountain whites, as well as those Ankida Ridge goodies. We had a sneak preview of the 2012 Chardonnay. Elegant, really promising. A good year for white wine in VA, and this one is beautifully balanced. I purchased their dry Petite Manseng, their Pinot Gris, 2011 Chardonnay and their dessert wine for now. Nice wines. Believe me, we will be heading back down when that lovely 2012 Chardonnay is released. Anyone wanting to take an overnight from up here in Maryland, to the wine country around Charlottesville has to come here. It is worth the trip. Posted in Food, Hobbies, Locavore, Real Food, Restaurants, Wine and tagged Food, foodie, Locavore, VA wine, wine. Bookmark the permalink.